Along the northern rim of the Bernese Oberland, where the white peaks of the High Alps finally make their drop off down to the wooded green foothills and valleys of the Swiss lowlands, stand in a row 3 mountains. 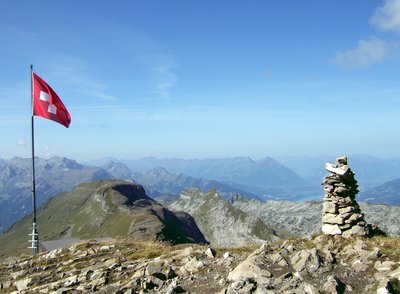 Each over 13000 feet tall, the Eiger, Monch and Jungfrau are some of the best known mountains of the Alps and though not the highest, the best known of the 3 is the Eiger. The reason for its fame or rather infamy, is the towering North Wall. Over a vertical mile of almost sheer rock face, the upper half almost permanently plastered with ice and snow and the lower raked by deadly stone falls. As if this isn't enough, these mountains are home to some of Europe's most inhospitable weather conditions. Fear not however, for our route does not lie up this fearsome wall, but across the slopes at its base from Eigergletscher station down to Alpiglen. The route can be done in either direction and my reason for doing it this way round was because I had just descended from Jungfraujoch so finding myself at Eigergletscher. The guidebook writer Kev Reynolds says that the route is well worth repeating so that you've done it in both directions and I very much agree. 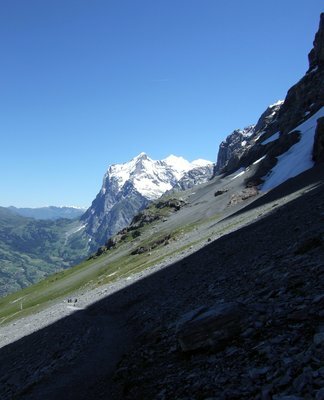 It's a fine route and I have since done the Eiger Trail again from Alpiglen walking back up to Eigergletscher. My return from the Arctic conditions on the Monchsjoch and Jungfraujoch some 4000 feet above had brought about a change in the weather from drifting snow to merely an overcast day of occasional blustery rain showers. I finished my meal of Schnitzel at the Eigergletscher Station restaurant and, shouldering my rucksack once again, ventured back outside. It was cool and breezy but the rain seemed to have stopped so I crossed the railway line by the tunnel entrance and followed the sign for the Eiger Trail. The way led up a little past the hostel, giving the opportunity to go up onto the ridge crest itself where the original Mitteleggi Hut had been placed since the new hut was built on the Mitteleggi ridge on the far side of the summit. The tiny hut was locked up but I could look inside to see the layout. It was something of a museum piece and quite fascinating. 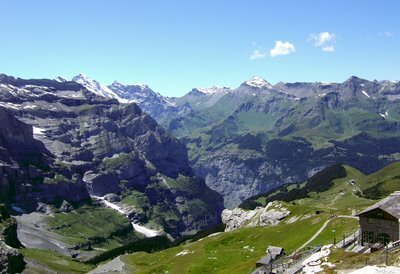 A grand spot too with views across the Lauterbrunnen valley around over Kleine Scheidegg and down to Grindelwald on the other side. I was at about 7700 feet here so it was warmer than it had been on the Monchsjoch but the wind, if anything was stronger, the gusts threatening to blow me from the ridge. I wasn't going to attempt to go much further up anyway, the way being barred by a huge rock pillar rising up towards the top of the Eiger. 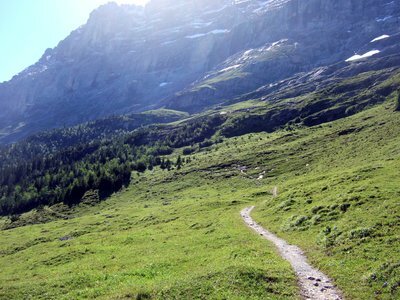 After taking a few photos I went back down past the hut and joined the trail winding down to the right towards Grindelwald and the Wetterhorn. It was a clear well prepared and marked path leading at first below cliffs on the right and then past a cavern-like tunnel in the rock before heading down at a fairly easy angle across the screes below the North Face. Descending all the time, the track led across a vast stone filled hollow. Down on the leftwere the meadows below Kleine Scheidegg with glimpses of the railway running through the trees beneath a long scree slope. Above on the other side, the slope rose to the base of grey cliffs which seemed to rise up forever, their tops hidden in the swirling cloud above. As I neared the bottom of the stony hollow, there appeared a large number of small cairns on the hillside. I can only assume they were memorials to those climbers who lost their lives climbing the face. It was however, a strangely peaceful spot, the view over the valley tempering the harsh rugged scene. I was reminded of the dangers by a distant crashing above., rock fall, one of the main dangers of climbing here. The way led up slightly before heading more steeply downhill. Here were 3 people coming up the other way, the first people I'd seen on the route. I said "Hi" as I heard they were speaking English but the 2 blokes were too engrossed in a heated discussion about where they were. The girl behind them gave me a despairing look. At least it was more or less impossible to get lost on this route, they'd reach the station soon then they'd know where they were! Still arguing, they continued on up the trail completely missing the small group of mountain goats grazing a shelf of rough pasture above us. I was reminded of a misty day at Esk Hause on Scafell Pike when this guy in a group of about 6 had been telling his fellow walkers the way back to Langdale in a voice that could probably be heard there. I'd had to politely put him right before he led his group off into the wilds of Upper Eskdale! 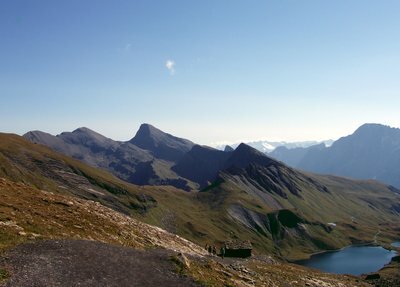 Anyway, the route continued down towards Grindelwald with a great view to the Wetterhorn beyond. The path was now over grassy pastures rather than stones and dipped down steeply a couple of times to cross small rivers cascading down from the face. The rain had started again but was only light as the route began to traverse a wide ledge onto a rocky section below the Mittellegi Ridge. There were good views down to the valley from this bit and below an impressive waterfall the path veered off down to the left zig zagging steeply down. There were no difficulties however and I finally crossed a small footbridge over a mini gorgeworn in the limestone by the river. The path I was on now joined another which crossed the hillside lower down. For Alpiglen, I now followed this to the left, the other way leading towards Pfingstegg, doubling back below the route I had just descended. A short fixed handrail section over a steep bit and I was down into the pine forest before crossing a meadow to Alpiglen station. The rain had just started up again as I boarded the train which was full of people returning from Jungfraujoch and Kleine Scheidegg. I managed to find a seat where I was duly entertained by a Japanese girl's efforts to photograph a dog on the other side of the compartment! 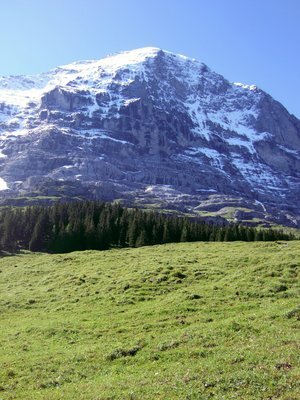 Please note - these photos shown of the Eiger Trail were taken on a subsequent day when the weather was better! Standing roughly northwest of Chamonix, the Brevent at 2525m or 8285 feet is perhaps the finest place from which to view the eternal snows of Mont Blanc directly across the valley. Viewed from Chamonix, the peak appears some 5000 feet above the town as a steep rock face with the cable car station perched overhanging its edge. A closer inspection shows a choice of easy routes to the summit from Planpraz station, the mid point on the Brevent cable car. The easiest is of course the cable car itself but that would be cheating somewhat! The best is probably to head up to Col du Brevent (signposted) and then follow the path along the ridge to the top, descending by the way described here. A full day outing would be to climb up from the valley via the forest paths and possibly continue to Refuge Bel Lachat before descending to Chamonix. There are many choices here, the route described is a quick way up from Planpraz and was the first time I'd climbed this peak. It was July 2002 and my first time back in Chamonix since family holidays years before. This time I was here to join a guided group attempting Mont Blanc, which we never got up due to the conditions, just climbing the Aiguille du Tour - but that's another story. The sheer size of the mountains here was awesome, so to get used to the scale of things and help acclimatise, I'd taken the telepherique that morning to Planpraz, with the idea of walking up the Brevent from there. Weather conditions were, as they say, marginal, so I opted for the shorter route. From Planpraz, I followed a wide stony track across the slopes in a roughly westerly direction towards the summit hidden in grey cloud. Turning off to the left of the main GR5/TMB route signposted to the Col du Brevent, I followed the track up behind some large rocks on the left and on more or less directly towards the steep cliffs I'd seen from the valley. As the track reached the steeper ground, it zig zagged sharply right and then upwards towards the ridgeline, the crest of which was half hidden by the grey mist hanging across the sharp rock edges. There were patches of snow covering the track in places but it was soft enough to walk through and gave no difficulty. This area would usually be snow free in summer. Approaching the lower part of the cliffs below the ridge, and the path curved round to the right again so I was now going back the opposite way but higher up the mountain. I entered a stony hollow which avoided the seemingly inpenetrable crags now up to my left. The cable car leisurely descended out of the clouds which seemed to be clearing again revealing the masses of ice on the slopes of Mont Blanc across the valley. I'd felt a few spots of rain earlier but that too seemed to have stopped for the moment. Leaving the hollow via its left slope, I soon gained the crest of the ridge revealing a rather misty view of the Aiguilles Rouges on the far side. Turning left on the top and joining the trail coming up from Col du Brevent on the right, I followed this trail over a few snowy areas to the summit of Le Brevent. From below it had looked as though the ridge involved some rock scrambling but it was revealed that on this far side, the path followed easy ground up gentle slopes to the top. There is that famous view of Mont Blanc taken from here, the one where people are enjoying drinks on the terrace just under the peak in bright summer sunshine. They weren't today. The upper parts of Mont Blanc were in cloud and a cold wind blew spots of rain and sleet around the closed cafe building on this high and stony summit. It had been a good first day back in the Alps though, and a walk I've done since in better weather than this. This is a walk part way up the Gouter route on Mont Blanc and is about as far up the mountain as the walker can safely venture. In addition - at 3167m or 10391 feet - it's the highest point reached by any non technical walking trail from the Chamonix Valley. One warm July morning in 2003 I'd got off the bus in Les Houches by the Bellvue cable car station. From here I was whisked swiftly out of the valley, the telepherique quickly climbing the steep wooded slope to Bellvue. It seemed immediately open and airy up here, having left the confines of the valley and the scent of sun warmed grass was in the breeze as I made the short walk to catch the train known as the Tramway du Mont Blanc. This mountain railway ascends from Saint Gervais to Nid d'Aigle. Bellvue's about three quarters of the way up. Like in Switzerland, the mountain transport around Chamonix is excellent and enables you to reach places in a day that would have been 2 day trips or major missions walking all the way from the valley. The obvious downside is that you can get too many people in once peaceful areas but that being said, the Alpine trains and cableways are infinitely preferable to having roads and car parks up here with all the extra noise and pollution that would bring. The train made its way leisurely along its route, traversing the mountainside and gradually climbing to the terminus at Nid d'Aigle. There was a deep valley below us to the right, while on the left steep slopes began to rise, the landscape becoming harsher and more rugged the further we progressed. Finally, after a short tunnel, the end of the line was reached. Nid d'Aigle is a high alpine pasture at something over 2300m bordering the Bionnassay Glacier which cascades in spectacular fashion down from the snow covered Aiguille de Bionnassay at the valley's head. A path led over and down to the glacier which was where most of the people leaving the train seemed to be heading. My way however led up the steep rocky slope behind the station and the path signposted 'Tete Rousse'. The route started as it would continue - rough, steep and stony. A relentless ascent of the mountainside beginning with a zigzag track marked with cairns and following a shallow gully higher up. I'd been up here the summer before in deep snow, it looked somehow more forbidding now, a desert of grey rock. 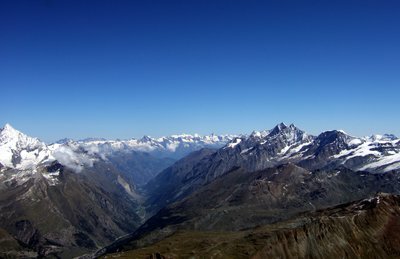 After nearly an hour, the gradient finally eased and on reaching the ridge, the view opened out into the Chamonix valley on the far side. The previous year, Id turned left here just past a small building below the ridge and scrambled up a few metres to find one of the best viewpoints in the area. Just behind the building, the 9000 foot high ridge drops off steeply overlooking the tramway's route, Les Houches and the length of the Arve valley towards Lake Geneva. The trail to Tete Rousse however went to the right, following the wide ridge before once again beginning to zig zag steeply upwards towards the jagged crest above. From here it was hard to see any easy way up there but as I climbed higher it became apparent that the path managed to find a way around or between the rocky obstacles. One or two spots had fixed rope handrails notably on the north side of the ridge where a wide ledge was crossed 7000 feet above the Chamonix valley. The summit of the Brevent opposite was far below and the Aiguille du Midi appeared in front, surprisingly close through a hole in the cloud. The gadient now eased again as the altitude became noticeable while the view back out to the west was rapidly becoming obscured as clouds rolled up the valley. The hut itself appeared at the last minute across a small flattish glacier. I opted to follow the ridge up to its top where it levelled before making a steep ascent to the Aiguille du Gouter, now hidden in cloud. Not having rope or crampons with me , I thought it unwise to cross the ice though it looked easy and I couldn't see any crevasses. The weather rapidly went downhill as I ate my lunch perched on some non too comfortable rocks on the ridge. The sound of distant thunder was the cue for a quick descent as I felt that an exposed ridge top over 10000 feet up was not an ideal spot from which to watch the lightning! I like storms but the phrase 'too close for comfort' sprang to mind! A little way down I was distracted by a group of large brown goats milling around on the rocks. I can never remember which is which - Chamois or Ibex - I'm sure these were Ibex being larger. I was surprised they were so far up - other than thin patches of moss on some rocks there was no food up here. At least there were grassy areas lower down. The rain began just before I reached the station, thunder echoing around the valley's upper walls. There isn't much shelter here and as there was now a queue to get on the train I'd have to wait for the next. Not relishing the thought of waiting, I set off and walked down to Bellvue, the rain easing as I reached the telepherique station. This must rank as one of my best days out in the mountains mainly thanks to the perfect conditions we enjoyed for the trip. 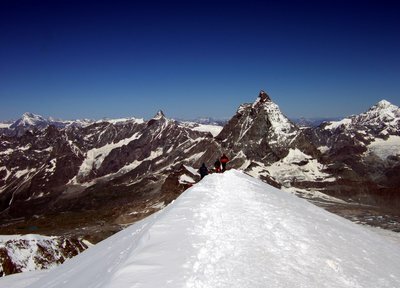 The ascent of the Breithorn at 4164m or 13662 ft is just outside the normal remit for walking as it crosses a crevassed glacier and ascends a snow/ice slope normally requiring the use of crampons. For these reasons, you need to go with a guide (or as part of a rope team if experienced on glaciers) but its not difficult - just make sure of acclimatisation before going over 4000m. In the predawn light of a June morning I made my way through Zermatt, following the river from my hotel. The streets were almost deserted at this hour and the thermometer read a cool 8 C under a clear sky. Crossing the bridge to walk up to the cable car station, I had a great view of the Matterhorn. Lit by the early morning sun, its pyramid, newly whitewashed by recent snow, rose into the blue far above the still sleeping village. "Ah, here's my group" I thought as I saw a group of people, obviously climbers, milling around near the station entrance, comparing ice axes and other pieces of kit. It's always a little unnerving to join a group I've never met before as I more often than not, go walking alone but they seemed a decent bunch. Our guide from Zermatt Alpine centre was a cheerful chap and I was immediately befriended by 2 German doctors who had an interesting tale to tell. They'd been mates at medical school and had gone off to practice as GP's in different parts of Germany. For anniversary presents their wives had let them both come down to Switzerland to climb mountains while they looked after the kids back home. I guess Jacqui had done the same for me. These 2 later invited me out to a bar to watch Germany v Argentina in the World Cup which beat staying at the hotel! The cable car to Klein Matterhorn climbs the 2200m from Zermatt in 3 stages. Firstly over the pinewoods up to Furi, then a fast and steep ascent to sub arctic Trockener Steg, followed by a wonderful journey over the icefields to the cold thin air of the 3800m summit. The view from Klein Matterhorn is well worth going up for though we were going still higher. It was below -5 C and yet the sun was hot as we set off across the dazzling white snow of the Plateau Rosa. The day was one of exceptional clarity with mountains maybe 100 miles distant as crystal clear as those across the valley. Moving in a line and roped together, we headed around to the left and across the snow towards a distant looking spot where the guide said we'd have a rest. I would have had one by now I think, but the pace though quick wasn't actually too bad. In a surprisingly short space of time we reached the rest spot where the tracks in the snow curved around more to the left. It had been fairly flat until now but ahead the slope rose up, steepening the higher you got. At this point we put on crampons and leaving our walking poles in a pile in the snow, set off again towards the peak. Italy was behind us with its craggy mountains and deep valleys spread out below us. All around was the silent world of ice and snow stretching along the ridge towards Monte Rosa's numerous summits. The slope steepened as we progressed higher in long zig zags, firstly with the slope up to our right and facing the Klein Matterhorn, now below us and then with Italy to our right and Castor, Pollux and Monte Rosa in front. It was hard going, easier if you could keep a rhythm, but fun all the same. A final stop below the steepest bit saw us almost level with the spiky peak of Pollux which is 4092m. "Nearly up" I said, relieved, to the chap in front who confirmed with his GPS that we were at 4050m. Only 100m or so to go. On up the steepest part without difficulty, and we were above the cornice overhanging the northern cliffs you can see from below. Our guide made sure we took extra care here though you couldn't really tell that we were above a 1000m drop as it was hidden by the slope. Not, though, the best place to fall off! Breathlessly up a snowy cone, the top of the ridge to my left and then - the sharp white peaks of the Bernese Oberland stood in a line beyond the hazy depths of the Rhone Valley 12000 feet below. Closer at hand were the dappled greens of Zermatt's valley at our feet. The Matterhorn, unfamiliar from this angle, rose up to just above our level and back out across Italian airspace there stood 2 prominent white summits resembling icebergs floating on the lowland haze - Mont Blanc and the Gran Paradiso. The ridge was narrow, but wide enough to walk along. To the south, the steep snow slope we'd just come up while to the north, a fearsome drop to the Monte Rosa Glacier. We took photos while our guide pointed out most of the peaks we could see. In the east the ridge dropped down and over the Breithorn's subsidiary summits before rising again to Castor and Pollux before reaching the Himalayan looking Liskamm and Monte Rosa. Far to the east over the top of the Allalinhorn, could be seen the far off snows of Bernina on the eastern rim of Switzerland. I borrowed an axe to scoop out a seat in the snow and had lunch at 4164m looking out across Italy. Our return was much faster and easier being downhill and we were soon back in a line quickly approaching the Klein Matterhorn station to the clicking of Japanese cameras. They'd been following our progress across the glacier like watching the peloton finishing a stage in the Tour de France. All in all what I'd call a good day out - Germany won the match by the way. Originally from the village of Lymm in cheshire I am the author of travel books including "A Long Walk in the Alps" while the previously mentioned foray into adventure thriller land is now here with my first novel; "The Colonel of Krasnoyarsk" now available at Kindle, Smashwords and several other places. When not at home I am most likely to be found wandering the hills of the Lake District or North Wales and my main interests are walking, cycling and outdoor photography. If you would like to see my efforts with the camera then they are on display in the Mountain Landscapes gallery and here on Travellerspoint. Whether this is a good or a bad thing I'm not sure but most people seem to like them so there they will stay for now.